For two days in May, 1999, the solar wind that blows constantly from the Sun virtually disappeared -- the most drastic and longest-lasting decrease ever observed. Dec. 13, 1999: From May 10-12, 1999, the solar wind that blows constantly from the Sun virtually disappeared -- the most drastic and longest-lasting decrease ever observed. Dropping to a fraction of its normal density and to half its normal speed, the solar wind died down enough to allow physicists to observe particles flowing directly from the Sun's corona to Earth. This severe change in the solar wind also changed the shape of Earth's magnetic field and produced an unusual auroral display at the North Pole. Starting late on May 10 and continuing through the early hours of May 12, NASA's ACE and Wind spacecraft each observed that the density of the solar wind dropped by more than 98%. Because of the decrease, energetic electrons from the Sun were able to flow to Earth in narrow beams, known as the strahl. Under normal conditions, electrons from the Sun are diluted, mixed, and redirected in interplanetary space and by Earth's magnetic field (the magnetosphere). But in May 1999, several satellites detected electrons arriving at Earth with properties similar to those of electrons in the Sun's corona, suggesting that they were a direct sample of particles from the Sun. "This event provides a window to see the Sun's corona directly," said Dr. Keith Ogilvie, project scientist for NASA's Wind spacecraft and a space physicist at NASA's Goddard Space Flight Center, Greenbelt, MD. "The beams from the corona do not get broken up or scattered as they do under normal circumstances, and the temperature of the electrons is very similar to their original state on the Sun." "Normally, our view of the corona from Earth is like seeing the Sun on an overcast, cloudy day," said Dr. Jack Scudder, space physicist from the University of Iowa and principal investigator for the Hot Plasma Analyzer on NASA's Polar spacecraft. "On May 11, the clouds broke and we could see clearly." Fourteen years ago, Scudder and Dr. Don Fairfield of Goddard predicted the details of an event such as occurred on May 11, saying that it would produce an intense "polar rain" of electrons over one of the polar caps of Earth. 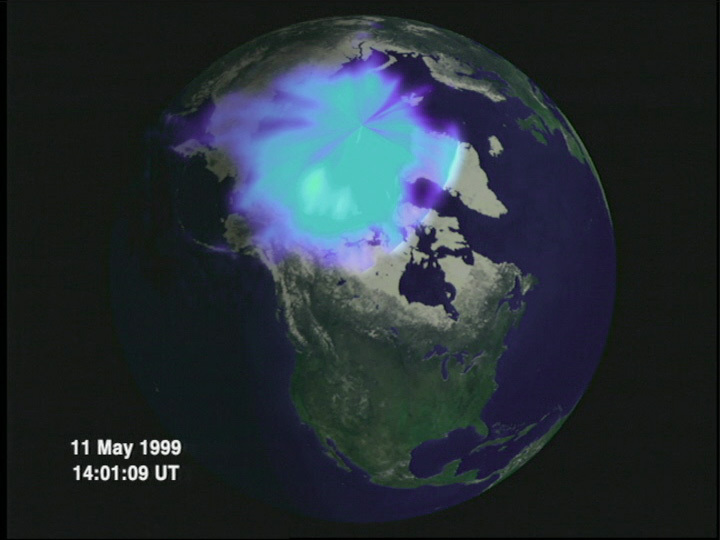 The polar caps typically do not receive enough energetic electrons to produce visible aurora. But in an intense polar rain event, Scudder and Fairfield theorized, the "strahl" electrons would flow unimpeded along the Sun's magnetic field lines to Earth and precipitate directly into the polar caps, inside the normal auroral oval. Such a polar rain event was observed for the first time in May when Polar detected a steady glow over the North Pole in X-ray images. In parallel with the polar rain event, Earth's magnetosphere swelled to five to six times its normal size. NASA's Wind, IMP-8, and Lunar Prospector spacecraft, the Russian INTERBALL satellite and the Japanese Geotail satellite observed the most distant bow shock ever recorded by satellites. Earth's bow shock is the shock front where the solar wind slams into the sunward edge of the magnetosphere. According to observations from the ACE spacecraft, the density of helium in the solar wind dropped to less than 0.1% of its normal value, and heavier ions, held back by the Sun's gravity, apparently could not escape from the Sun at all. Data from NASA's SAMPEX spacecraft reveal that in the wake of this event, Earth's outer electron radiation belts dissipated and were severely depleted for several months afterward. "The May event provides unique conditions to test ideas about solar-terrestrial interactions," Ogilvie noted. "It also strengthens our belief that we're beginning to understand how the Sun-Earth connection works." Left: This movie, which can span from 2 to 6 hours of actual time, shows the most recent images of the Earth's auroral region taken from space by the Ultraviolet Imager (UVI) Instrument on board the POLAR spacecraft. New movies are generated every 6 hours. Hit reload for the latest animation or visit the UVI aurora home page for new pictures every 7 minutes. Solar Cycle Update Oct. 14, 1999. Updated predictions from NASA scientists place the solar maximum in mid-2000. 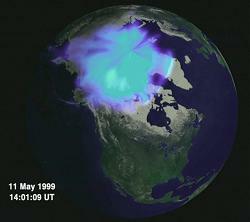 "Cool" microflares could be solar hot spots May 31, 1999. Secret of coronal heating may be multitude of tiny blasts. Finding the smoking gun before it fires March 9, 1999. Physicists discover a new tool for predicting solar eruptions. Science Data for "The Day the Solar Wind Disappeared"